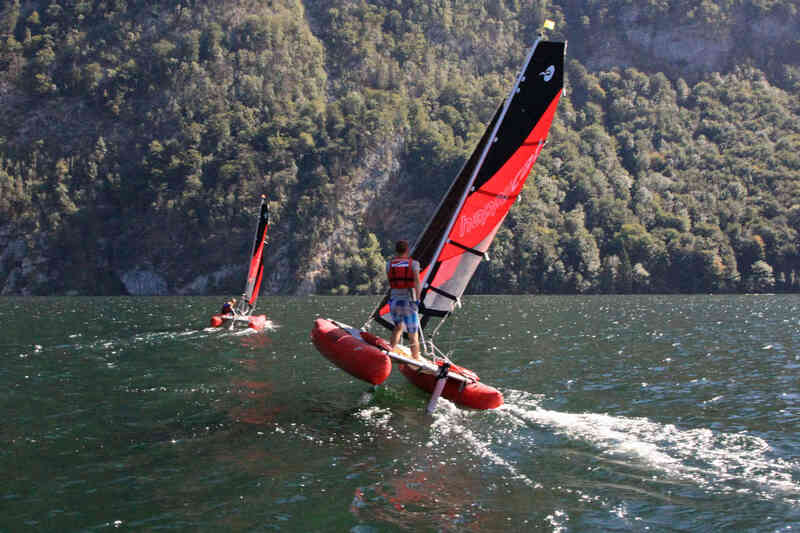 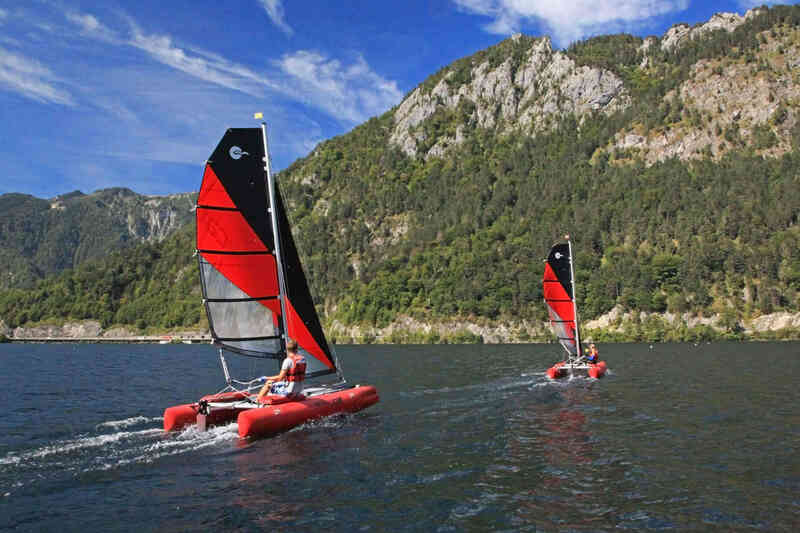 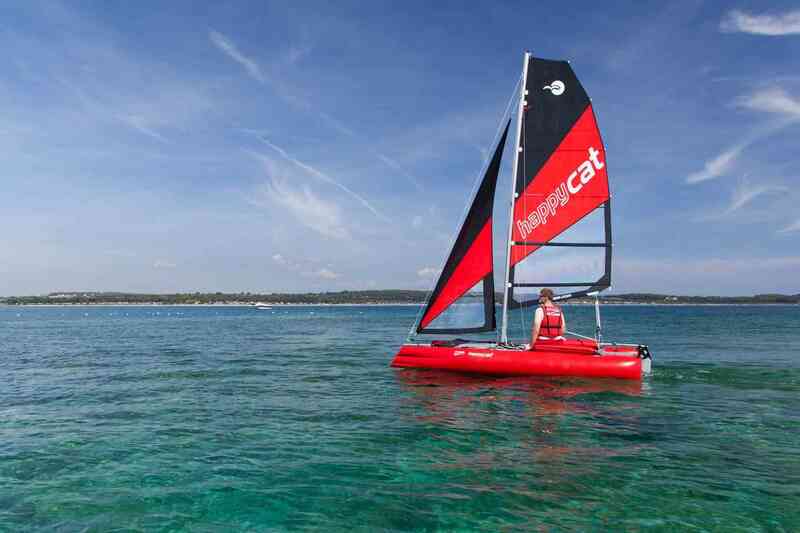 Unbelievably small in the pack-bag yet with so much sailing pleasure to offer: The handy sailing boat for solo sailors is a fast and agile fun catamaran that is ready to use in no time: From your camper van onto the water in just 20 to 30 minutes! 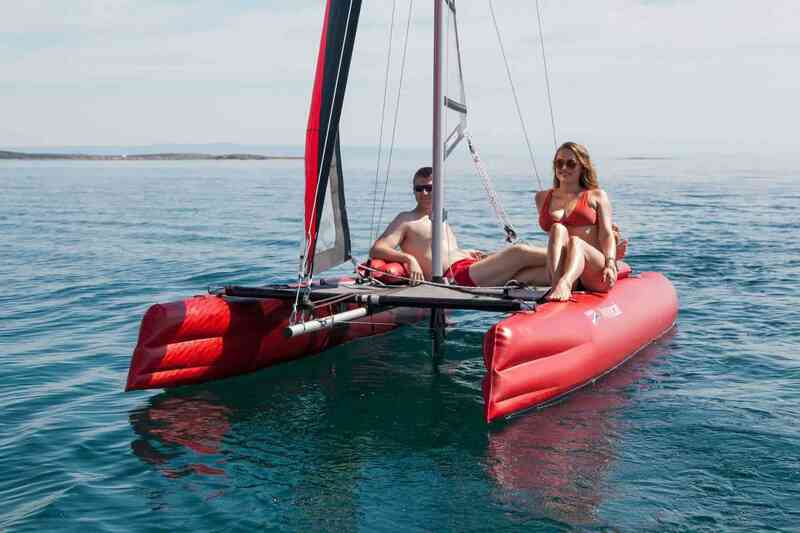 The NEO is very light and makes it all the easier: The inflatable catamaran can be easily stowed away; it is spectacular – and light – to sail on one hull and easy to set back upright if it capsizes. 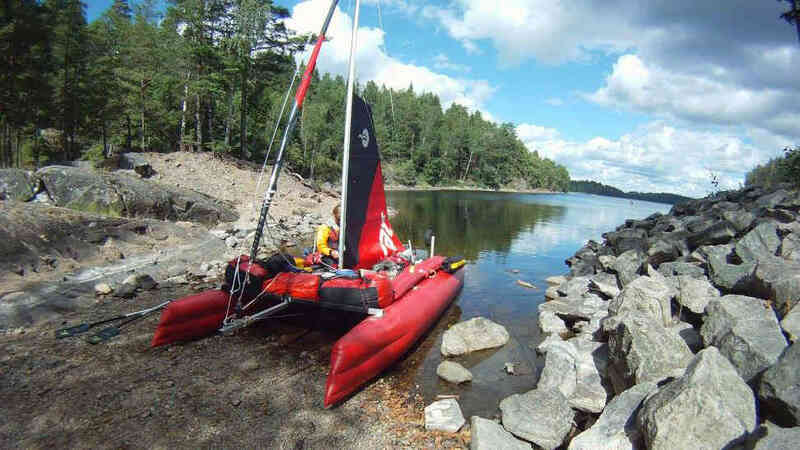 Ideal for easy sailing, beginners, young people and up to two people on inland waters: Perfect for all those who appreciate lightness. 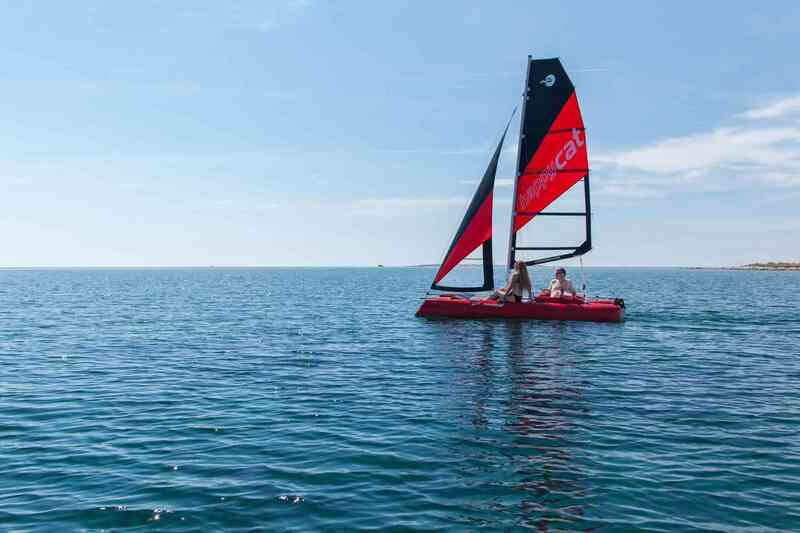 Already at light winds fantastic sailing pleasure. 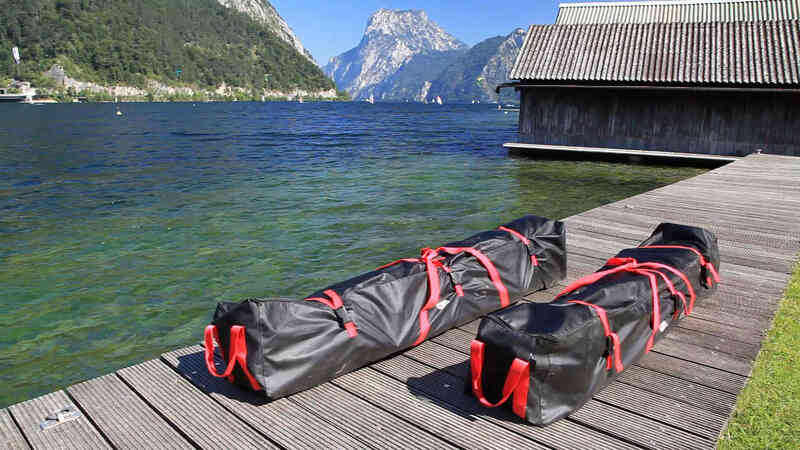 The two practical pack-bags for the NEO measure only 185 cm so that they can be easily stowed away in your camper van or car. 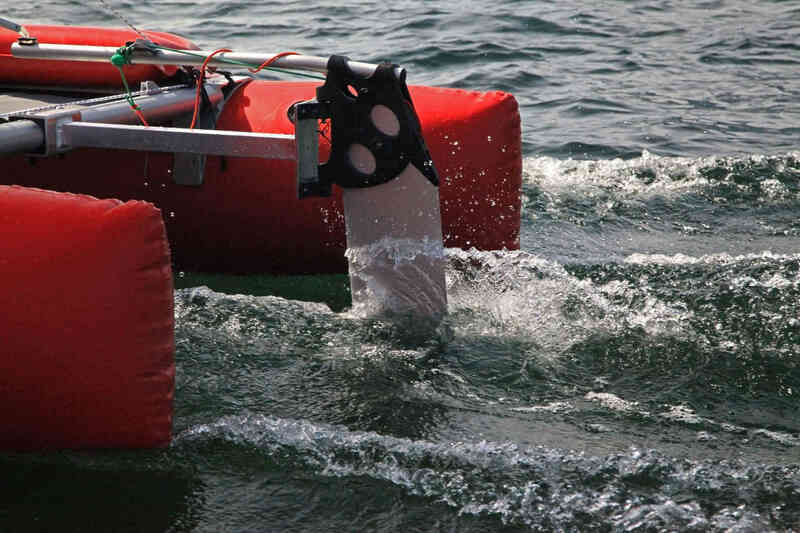 More buoyancy, extra loads, increased safety – and smooth sailing with less spray: The convex hull bottom reduces resistance at the bow and stern, and the modern Wavepiercer bow cuts through the waves. 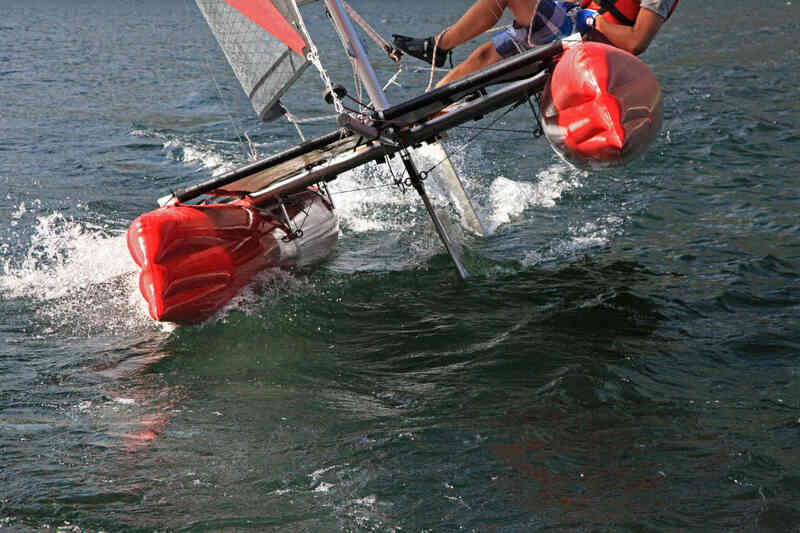 You will be the fastest sailor on the water! 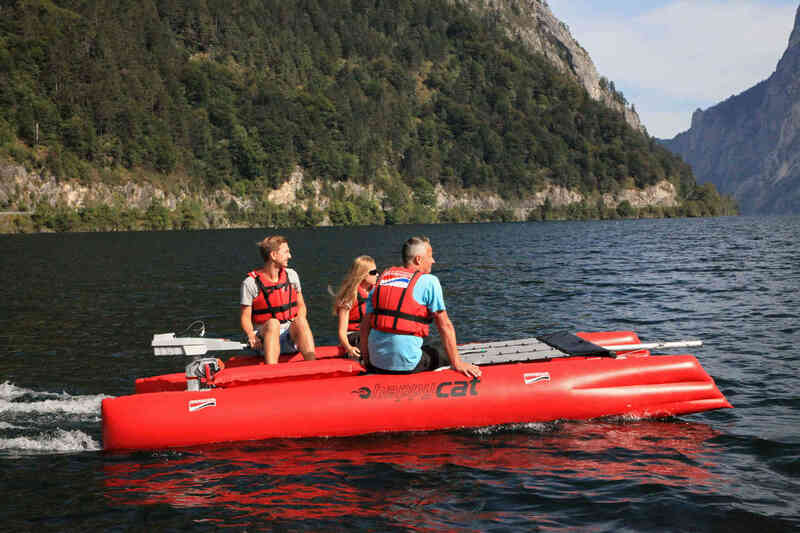 It is has been developed and optimised through tank testing and the boat-skin is hand made from tough Grabner car tyre rubber. 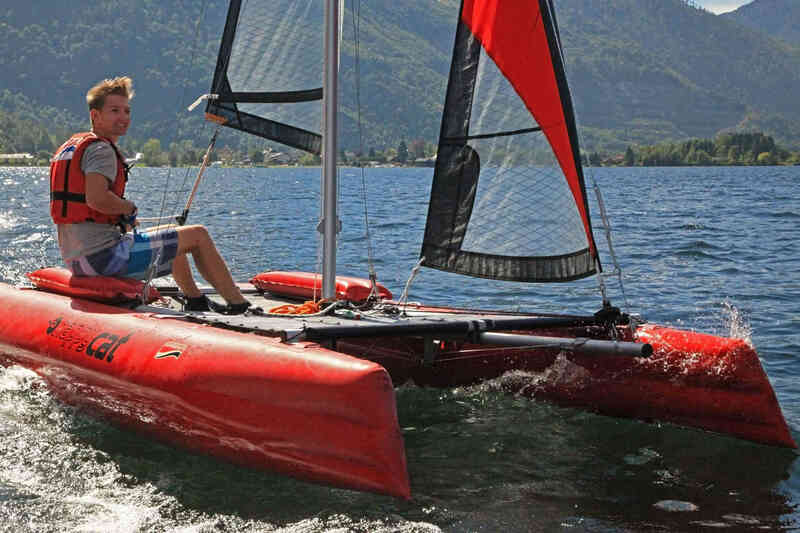 Frame with internal profile: The frame doesn’t twist, the hulls don’t bounce off: The profile frame, which is made from saltwater-resistant anodised aluminium, is firmly connected to the hull at the top and at the sides with four sleeve inserts. 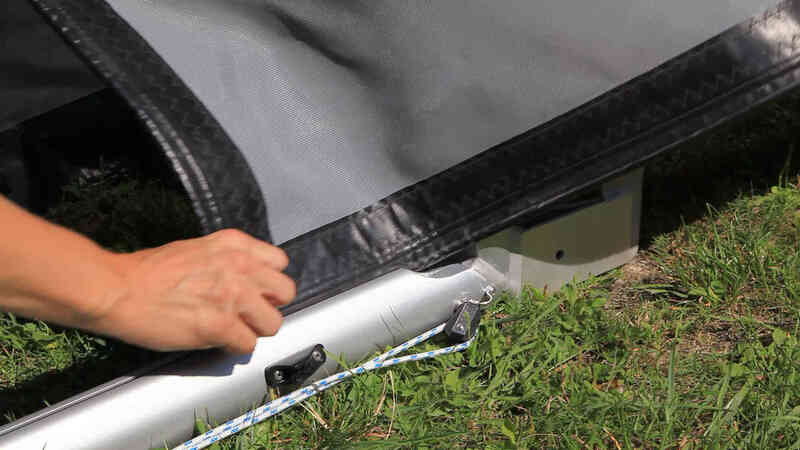 These angular connectors provide torsional stability, while the trampoline mesh is integrated seamlessly and directly into the profile frame. 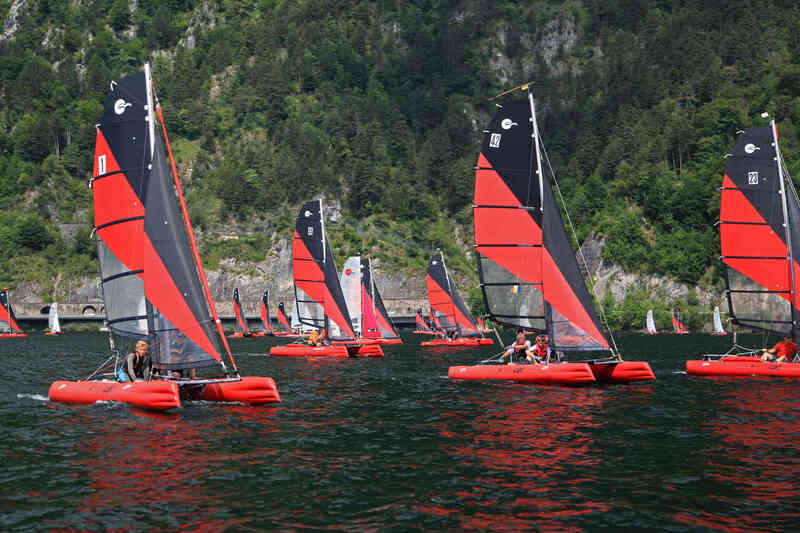 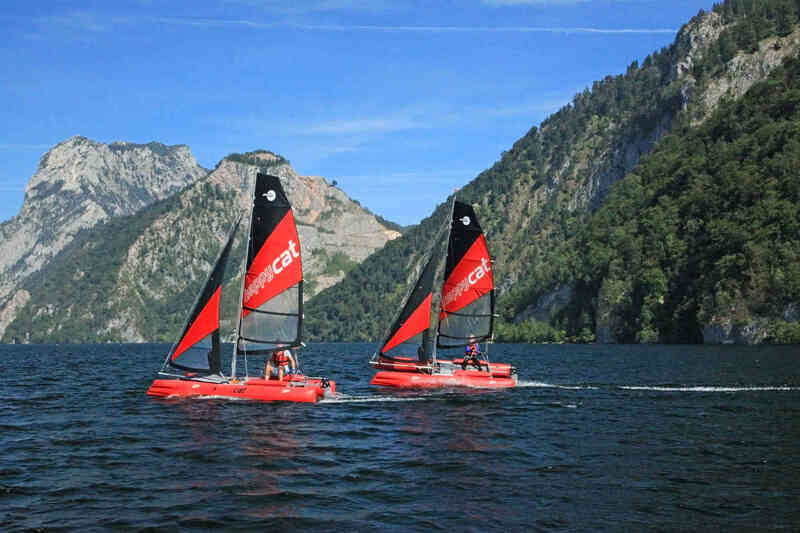 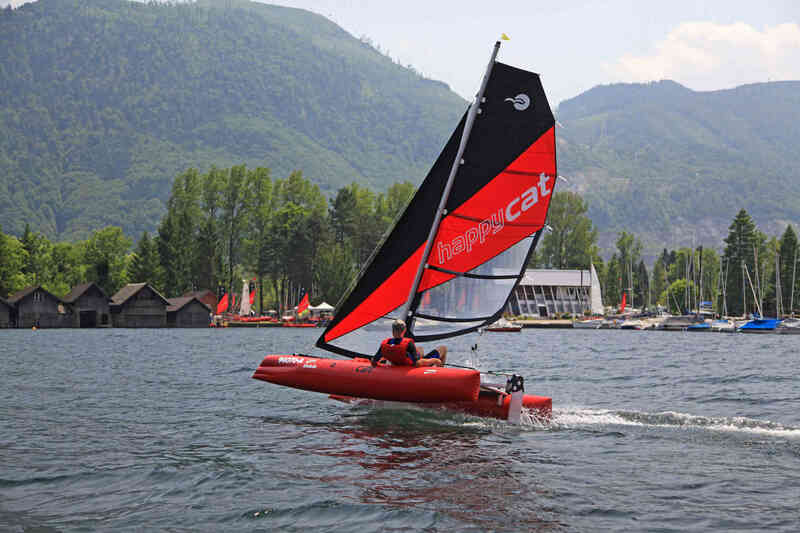 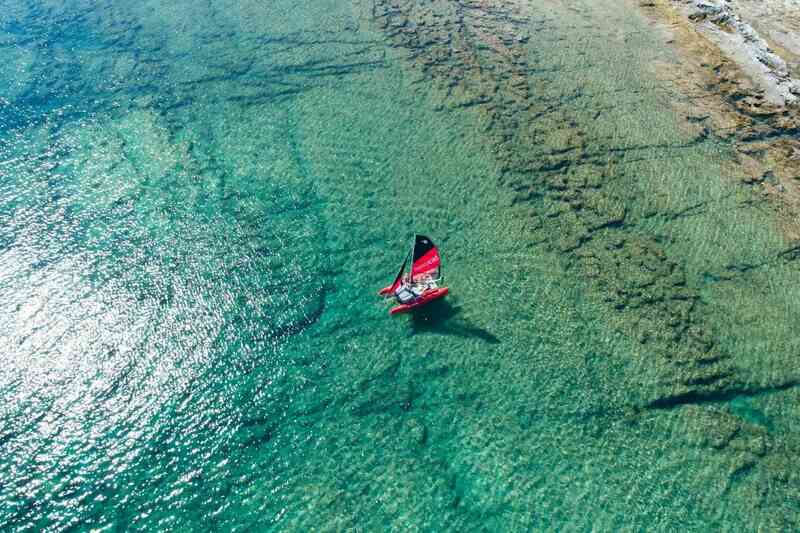 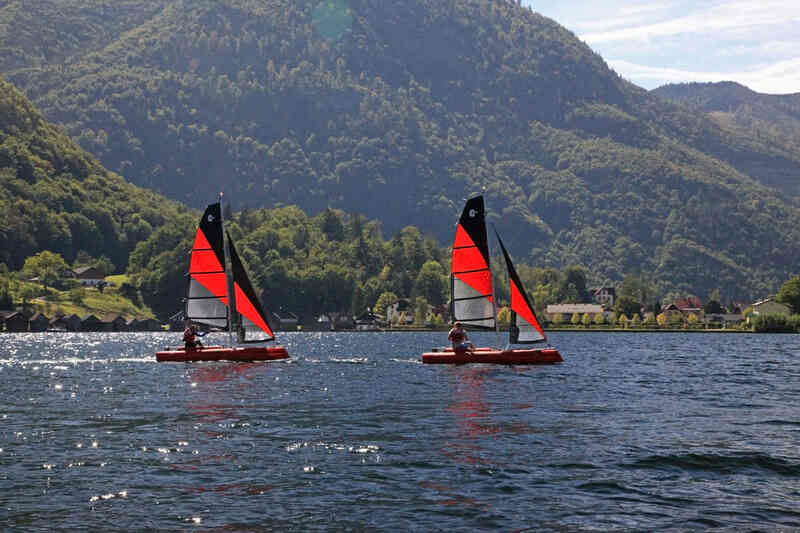 The deeper the centreboard extends into the water, the better it reduces lateral drift – the centreboard of the HAPPY CAT reaches particularly deep and it can also be infinitely inclined to optimally trim the pressure point to the speed of each course. 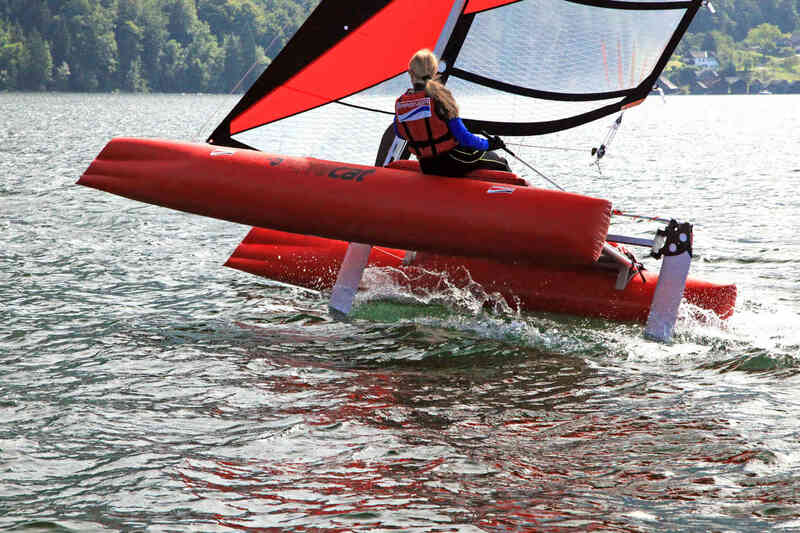 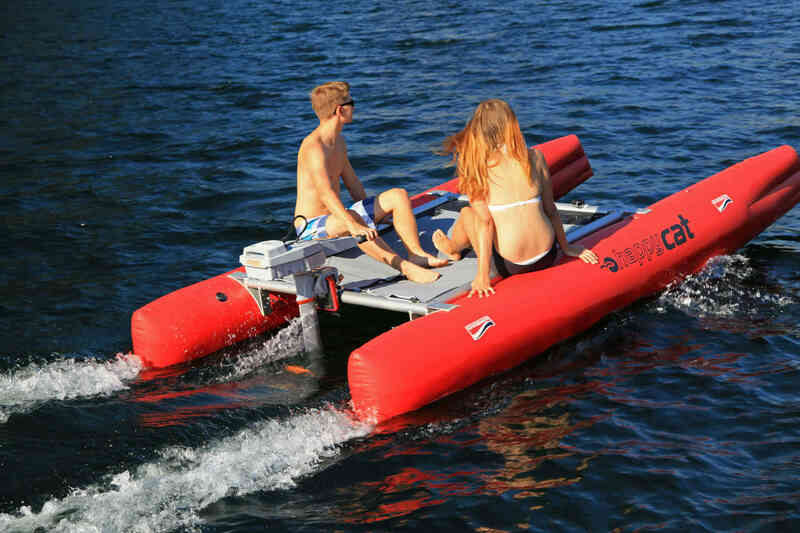 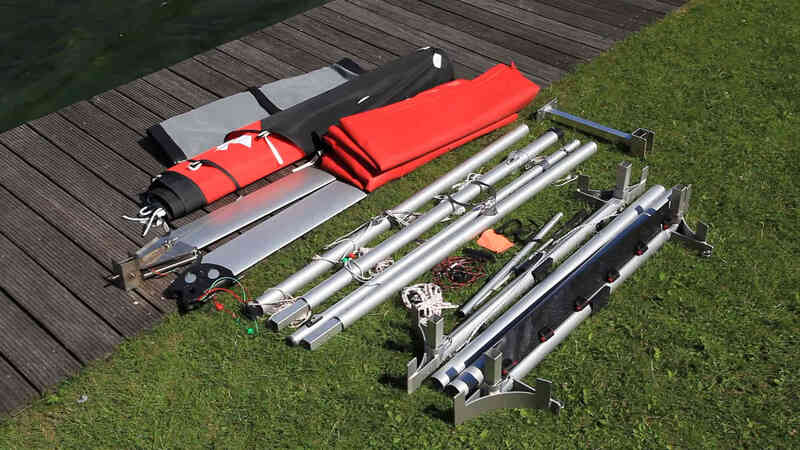 The extremely robust and hydrodynamically optimised aluminium centreboard retracts automatically when it touches the ground and can be pulled in completely during landing. 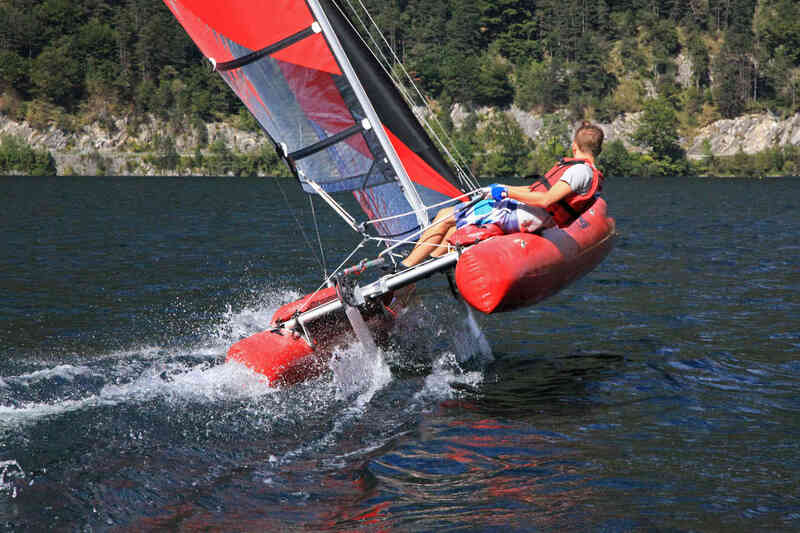 Servo-like steering: The high-speed rudder, which is made from strong aluminium and shifted towards the rear, ensures easy operation and smooth sailing while improving the steering control just like a hydrodynamically optimised blade that extends deep into the water. 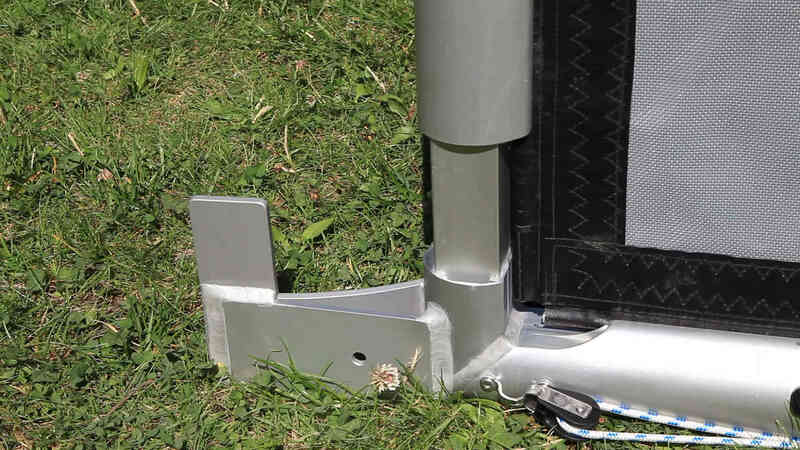 It releases automatically when it touches the ground. 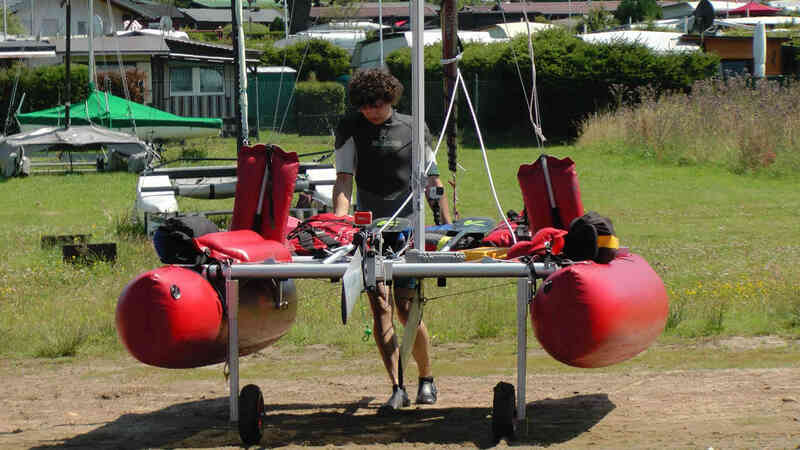 The practical mast foot joint makes it easy to right and lower the mast, which can be righted by just one person. 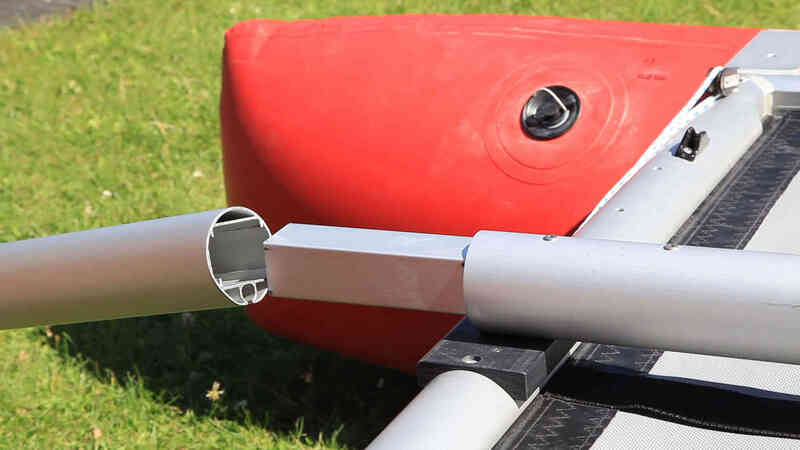 Angular connectors keep the mast stable. 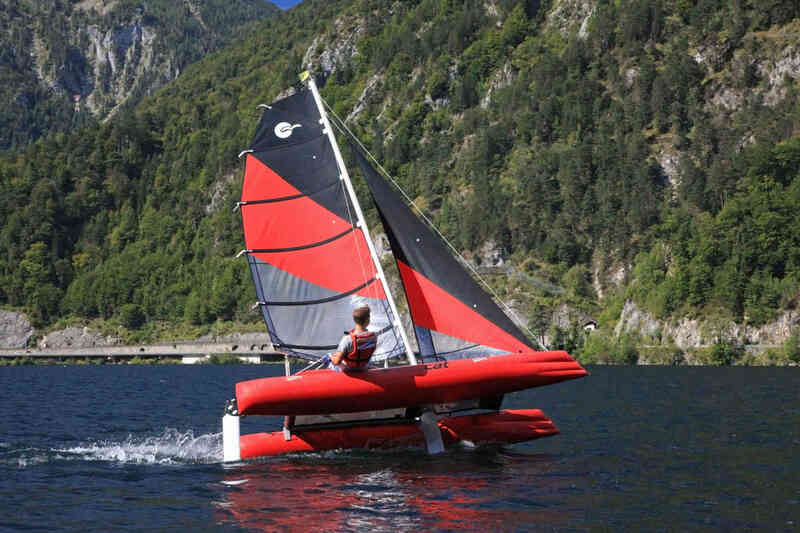 The sail is directly retracted directly and flush into the mast profile to become one unit with the mast which rotates together with it – this results in a professional profile. 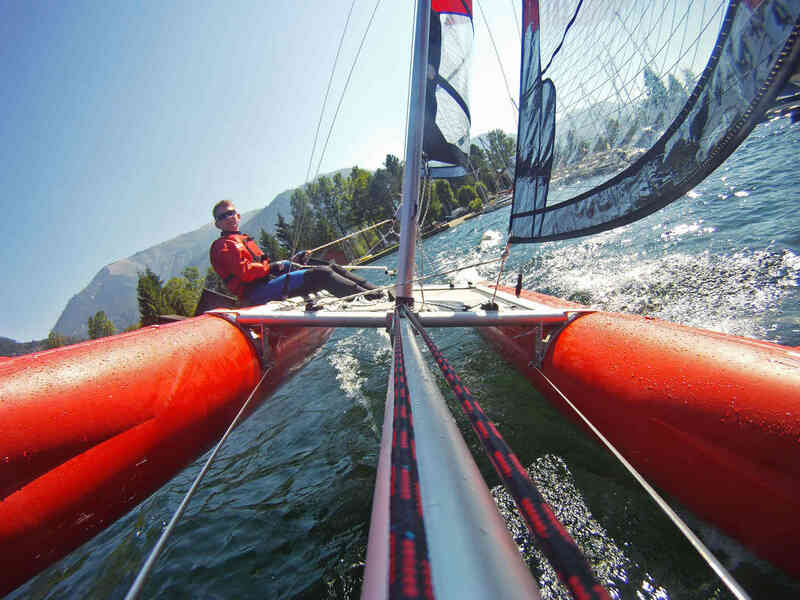 Double shrouds and the additional forestay increase safety and ensure that the mast bends in a controlled manner to optimise the sail profile. 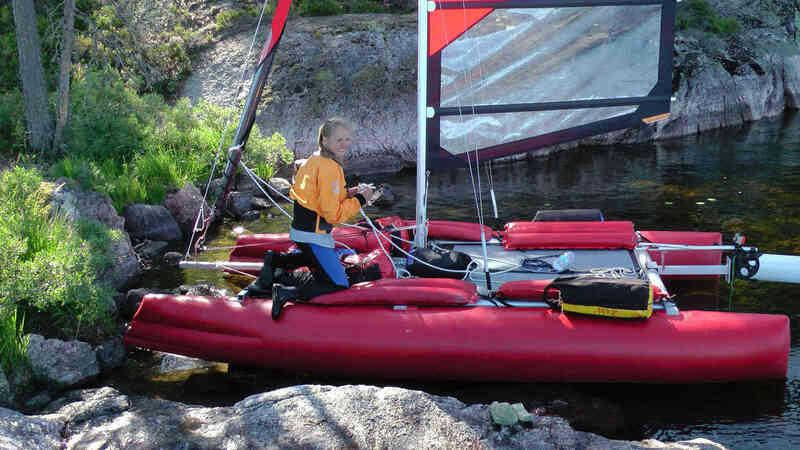 The mast can be adjusted/left erected independently from the sails. 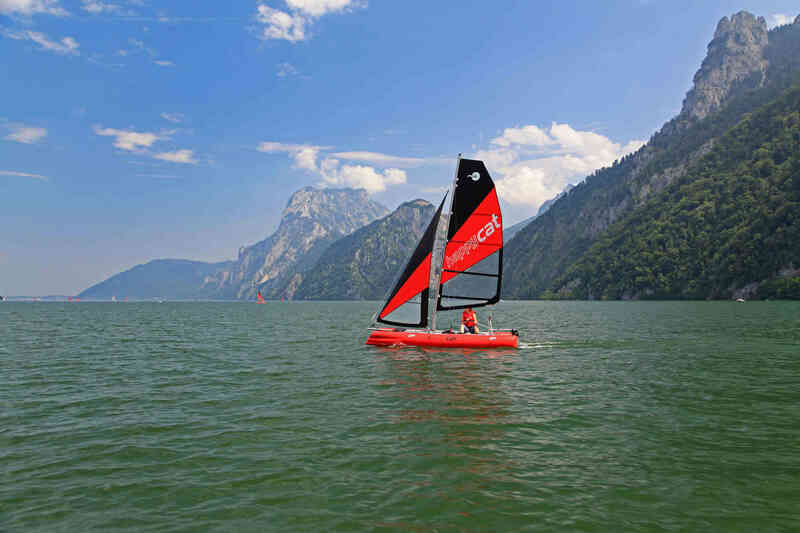 Sailing at high speed: The upper section of the Square Head mainsail is wider, which allows you to sail at high speed even in light wind conditions; the modern shape of the fully battened 6 m² mainsail, which is made from thick Dacron canvas, provides you an ideal profile for any wind condition, and thanks to the sail surface, which has been extended further downwards, the formation of air vortices is reduced to a minimum. 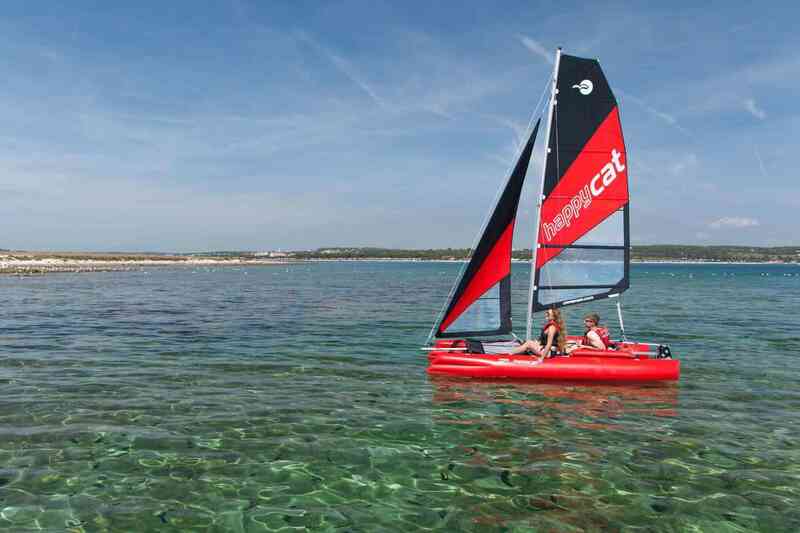 Large, reinforced windows provide the skipper with unobstructed all-round visibility. 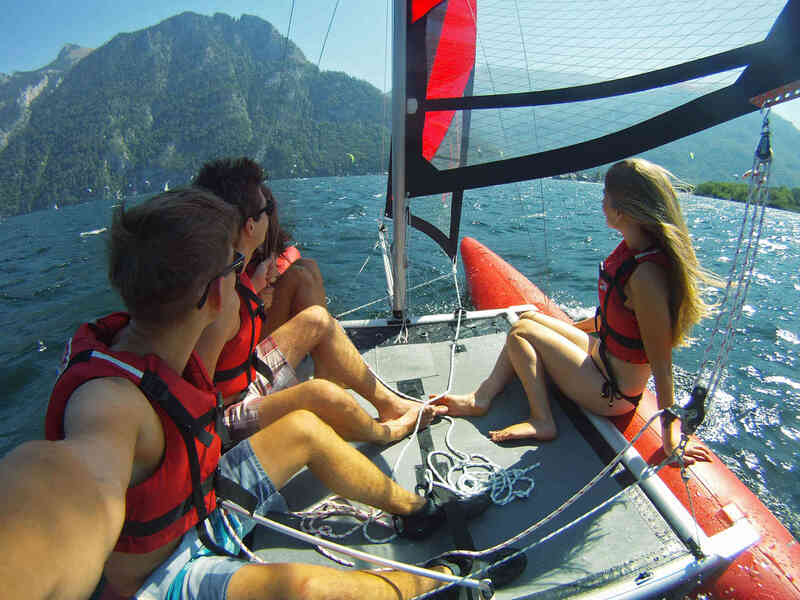 Foresail advantage: The 3 m² jib reaches up to the mast to allow you to sail with more height using the tow points which are fixed at an ideal position close to the mast; the comfortable continuous jib furler makes handling easy – with no skewer at all. 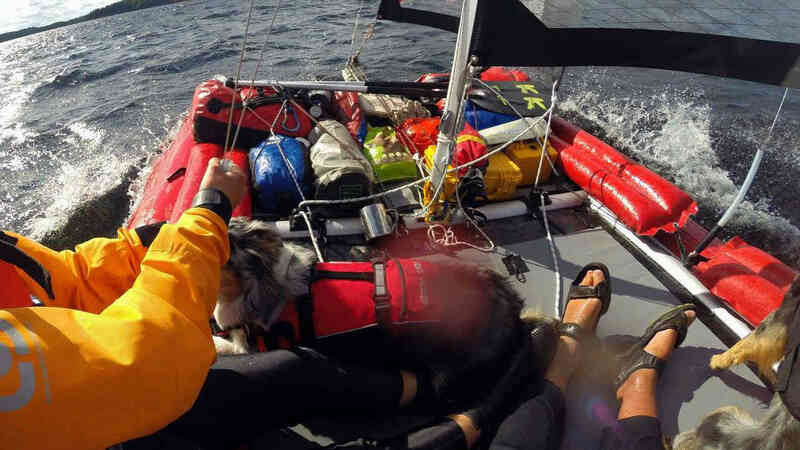 Before the wind, wind abeam or close to the wind: Depending on the course, the tow point of the mainsheet is moved towards luff or lee using the traveller and the “twist” of the mainsail is reduced. 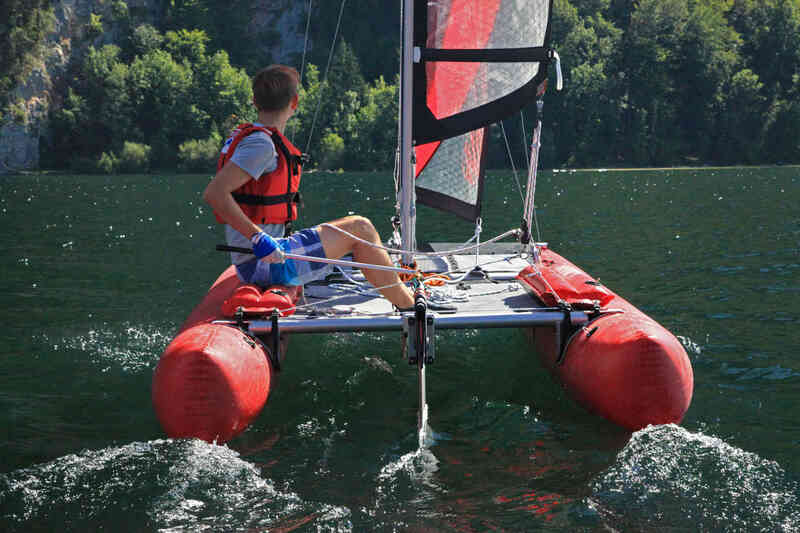  Flat or bulging sail: To perfectly adjust the mainsheet profile to the wind conditions, the mainsheet is hooked into the clew plate further towards the front or to the rear. 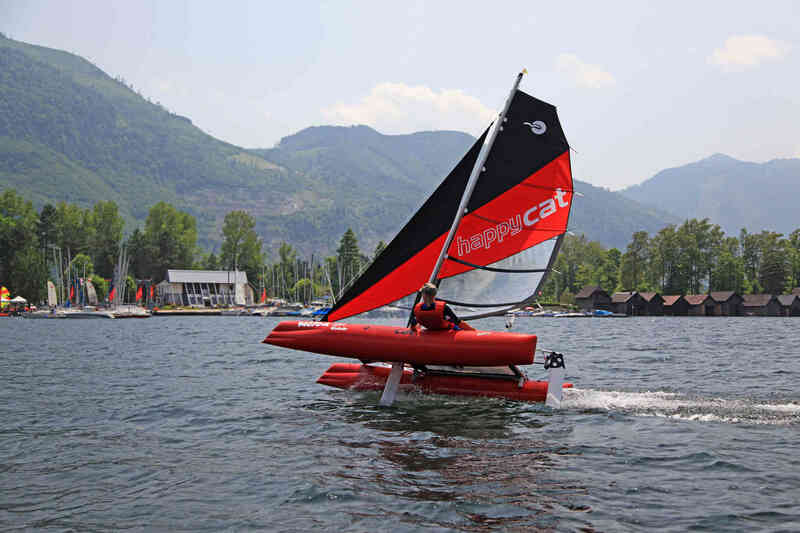 Sailing action with the HAPPY CAT NEO in formation. 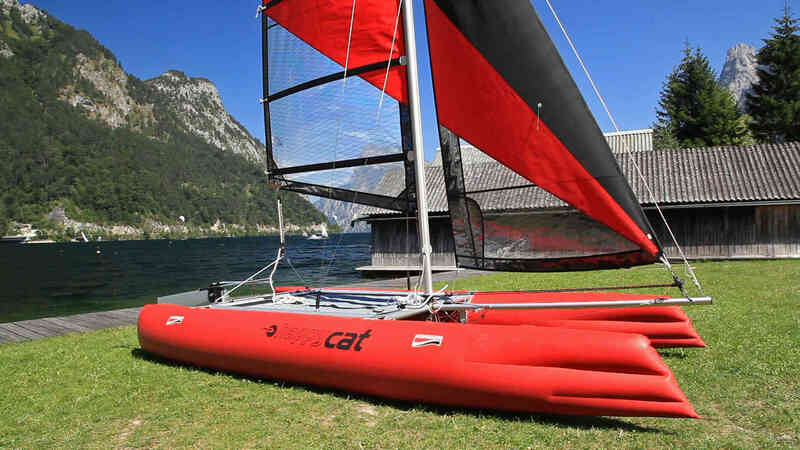 13' 3" x 1' 6"